In the summer of 2011, I had the exciting opportunity to go to Singapore and Thailand. Our friend, Lena, was on an ex-pat assignment in Singapore and we looped in a trip to Thailand. Of all the note-worthy events from the trip, my ability to sleep for any length of time on planes or in airports seems to top the list. Mr. Prevention frequently flies to China, India, Mexico, Brazil, and Italy for work. He has adapted to hopping time zones but between the 2 of us, my body adjusts much, much better to time changes. And seriously, I can sleep on a plane or in an airport like it’s my job. It doesn’t matter if it’s my first hour of sleep in days or my 16th hour of sleep in a single day. I am a champion sleeper. However, in my own bed on a set schedule? Not so much. Another favorite memory from that trip includes the party hotel Mr. Prevention had us stay at in Thailand. The place was swarming with 20 and 30-somethings that were out for a good, good, GOOD time. All night. Every night. Sleeping with techno music blasting and drunks all around was rather challenging. The people watching? Unbeatable. The entire trip, especially Singapore, was insanely, ridiculous, tortuously hot. I would step outdoors and instantanously felt the need to either return to air conditioning with 0.2 seconds, or hop in the shower. Needless to say, we walked a lot. I sweat…a lot. I also tried durian. It was pretty disgusting. Here’s a YouTube video to serve as proof of what went down. Some of the best things we had to eat on our trip was Chili Crab, Pepper Crab, and these fluffy, sweet and chipotle pork buns. 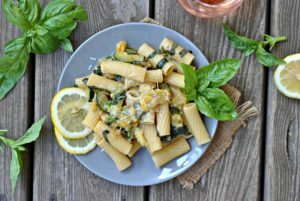 I was bound and determined to recreate these dishes at home and I did so with the crab dishes…rather successfully, I might add. The pork buns were a bit more of a feat…however, I did purchase the bamboo steamer off Amazon right after our return in July 2011. Since that time, the bamboo steamer has only started to collect dust. But finally, it was used…and not on pork buns, but on tamales. 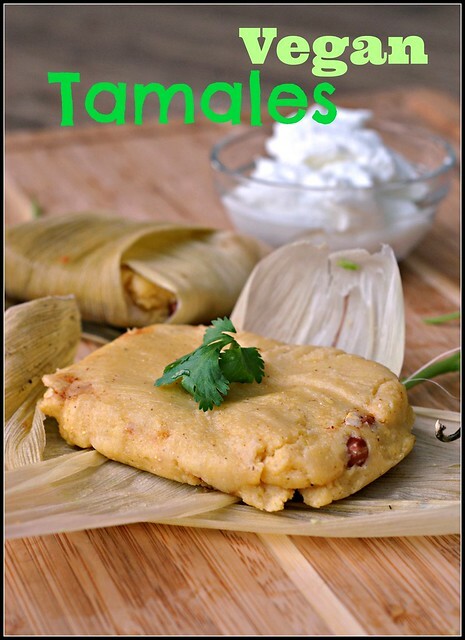 Vegan tamales. 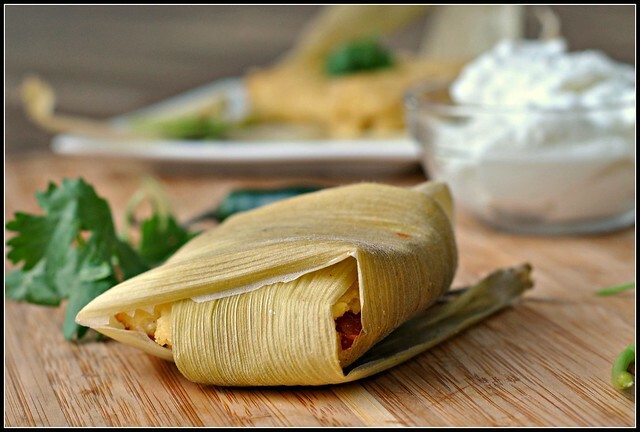 Truth be told, tamales have been on my cooking bucket list — that running list in my head of all the recipes I want to try. However, the lard has always deterred me from actual trying them. Lard…not-so-healthy. Shortening, even…not-so-healthy. 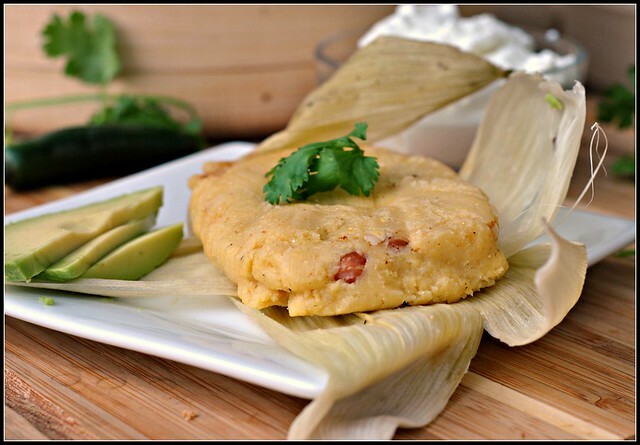 This vegan tamale recipe? SUPER healthy…and sooo, sooooo good. My only regret now is waiting way too long to utilize that steamer and to make tamales. Perhaps pork buns should be next to go in the bamboo steamer! Lard, what? These tamales are phenomenal sans the lard and sans the meat. Enjoy! Bring the water, salt, and olive oil to a boil. Turn off the heat and slowly stir in the masa. Shuck the corn and reserve the husks. Using a small knife, cut the kernels from the cob of 2 of the ears of corn (safe the rest for other uses or to freeze!). Heat 1 tablespoon oil in a saucepan; once hot, saute the onions for 3-4 minutes or until softened. Add the garlic and saute 30 seconds, stirring constantly until fragrant. Add the diced tomato and spices and cook until heated through. Add the beans, serrano, corn, and cilantro and cook until the beans are heated through. Pinch off a piece of masa and flatten in the palm of your hand. Spoon a little bean mixture on top and top with additional masa to seal in bean mixture. 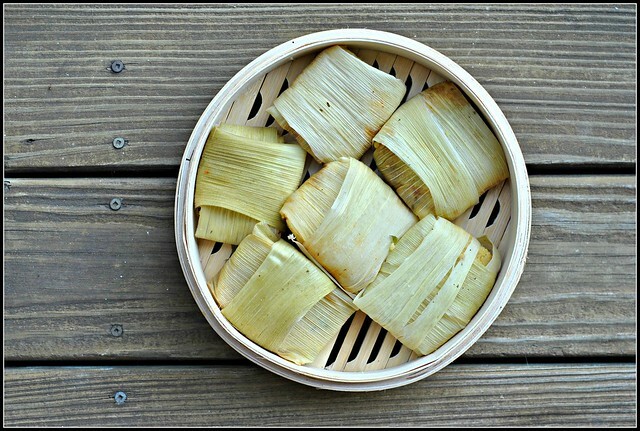 Place on the cross section of two corn husks layered into a "X" to wrap the masa, sealing the sides and place into a bamboo steamer, seam side down. Repeat with remaining ingredients. Fill a wok with a few inches of water and bring to a boil. Place the steamer over the boiling water and steam the tamales until the contents are hot, about 20 minutes. Looks like a deary one here today. 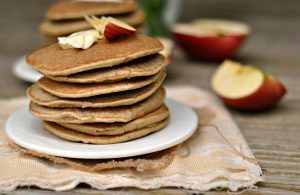 That means…cookbooking! I have to try making these! I’ve never really thought of making tamales actually but I should get on it before the last of the corn for the season (although I might be too late) already. Thailand is on my bucket list. I want to stay at the Four Season tents (no rowdy kids there, I expect!) and go riding on elephants. Thailand is pretty cheap as a destination, but of course I pick the most expensive resort possible that I want to go to. classic. Thanks for such a great recipe. I have 3 questions? I am used to using no oil in my frying or spraying the pan and wiping off all but a thin layer to fry onions etc. Would this be OK to do? I’m vegan and following an extremely low fat physician monitored diet. I traditionally wrap my tortillas. I learned to do this from my Abuella. Is it OK to wrap your tamales this way? If I’m out of pinto beans can I use black beans?